A large part of what makes poker such a popular casino game are the multiple ways in which one may approach it. It’s rarely as simple as ‘whoever has the best hand wins’, though this is the essence of poker rules. Many of the best players, however, are adept at the art of bluffing, often able to win rounds not by strength of hand alone but by their ability to read the reactions of others and protect themselves from being similarly read by those sitting around the table. This can lead to other players folding, unsure whether their hand will win during the showdown, and a skilful bluffer may then find themselves able to win hands despite holding lower strength cards. Of course, to be able to bluff effectively still requires a good knowledge of the strength of the hand you’re holding. This is arguably even more important for bluffing as it inevitably affects any risk/reward strategy employed. Bluffing doesn’t work if you constantly do it, as you’d become just as predictable as if you never bluffed at all. 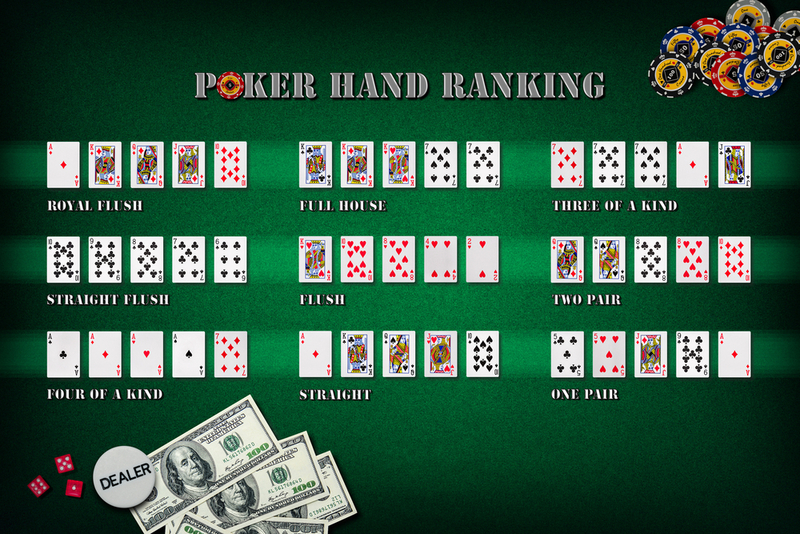 Ultimately, knowing your poker hand rankings is essential for success, whatever your play style. Here we’ll look at the best to worst scenarios. But first, the basics. Each individual card has a value, from the Ace down to the lower numbered cards. Whatever kind of hand you get, the higher value cards held could be decisive. Accounting for the lack of any doubles or other combinations, a player holding an Ace and a King will beat another player holding only a King and Queen, for example. Before getting into any further details, familiarise yourself with the unique ranking of each individual card. Now, onto the more valuable poker hands that all players should be looking to capitalise on. The best and most coveted hand in poker. You won’t be seeing these very often no matter what your skill level. This consists of the top five ranked cards – Ace, King, Queen, Jack, Ten – all of which must also be the same suit. When it comes to poker hands the odds of getting either of these is already high; getting them together is twice as high as that. It will feel almost like winning the lottery when you find a Royal Flush, because in poker terms the odds are higher than anything else by some distance. No need to worry about bluffing here; a Royal Flush is basically a guaranteed royal win. Like a Royal Flush but with cards of lesser value. The Straight Flush consists of five consecutive cards sharing the same suit, between two and ten. It’s possible for two players to get a Straight Flush and go up against each other in the same round; in this case, the player with the highest value card wins, so a player with a straight ending in ten will beat the other player if theirs ends at eight or nine. You would have to be quite unlucky to lose in this scenario but it’s worth bearing in mind that a Straight Flush is not necessarily a guaranteed win like its royal equivalent. If a flush is out of contention, the next best hand you’re looking for is known as Four of a Kind, or a ‘quad’. It’s quite self-explanatory; four cards of the same rank, i.e. four tens, line up and you’re left with one card left over. This fifth card would only come into play if another player gets the same valued quad as you, a scenario so unlikely that you may never see it happen. Otherwise, two players facing off with their quads will have their duel settled by which is the higher valued quad – a quad of tens will beat a quad of sevens, for example. A Full House uses all five cards, consisting of Three of a Kind alongside a pair. Individual rankings of each will again come into play if another player has a Full House. The Three of a Kind gains priority in this case; if you have two aces and three fives, its overall value is decided by the fives. Basically, flush refers to lining up one particular suit such as hearts or spades. Value of the cards does not matter here – unless of course you’re going up against another flush, in which case it will come down to individual values of your held cards. Counterpart to the flush, a standard straight consists of five cards of consecutive value. Their suits do not come into play; though if you were fortunate enough to have both then you’d be playing with a Straight Flush or maybe even a Royal Flush as mentioned above. Just like the quad but with one less card of the same value and lacking the pair that would make it a Full House. A potentially vulnerable hand but can still reap rewards. Better than one pair at least. You’re looking for two Kings and two Queens or something similar. The higher ranking of your cards, the better in this scenario. If nothing else, you’ll at least be wanting the consolation of two cards of the same rank, making a pair. Of course, it needs to be a high-ranking pair if you want to have a chance. Otherwise it’s time to use those invaluable bluffing skills to win a round with this kind of hand.